This is the first of a few New Nordic recipes I'm creating in collaboration with King Arthur Flour. Brownies are all-American, but I've incorporated Scandinavian flavors of ginger, orange, and traditional Swedish pearl sugar. My friend who lives in Sweden says that these could also be baked in a round tin and called Kladdkaka, an unleavened chocolate cake with a gooey center. If you follow me on any social media platform (you totally should, I'm hysterical on Twitter and sappy on Facebook), you've seen me raving about these brownies. And discussing techniques for cleaning frosting off my keyboard. They are rich, chocolatey, gooey but not underbaked, and they have a nice crunchy crust and firmer edges. I honestly think they are the best brownies I've ever had, gluten-free or not. It tastes exactly like a Terry's Chocolate Orange. Good enough to eat by the spoonful, followed by a gulp of ice-cold milk. I think it's the next "Nutella." As if Nutella would ever be "over." But seriously. The frosting recipe makes just enough extra for a few spoonfuls (I think of these things. Aren't you glad we're friends?). If you didn't watch the King Arthur Flour ingredients video, you might be thinking I've gone crazy and added giant crystals of kosher salt to my brownies. Fear not, it is actually Swedish Pearl Sugar! This texture switch really makes these brownies knock-out. 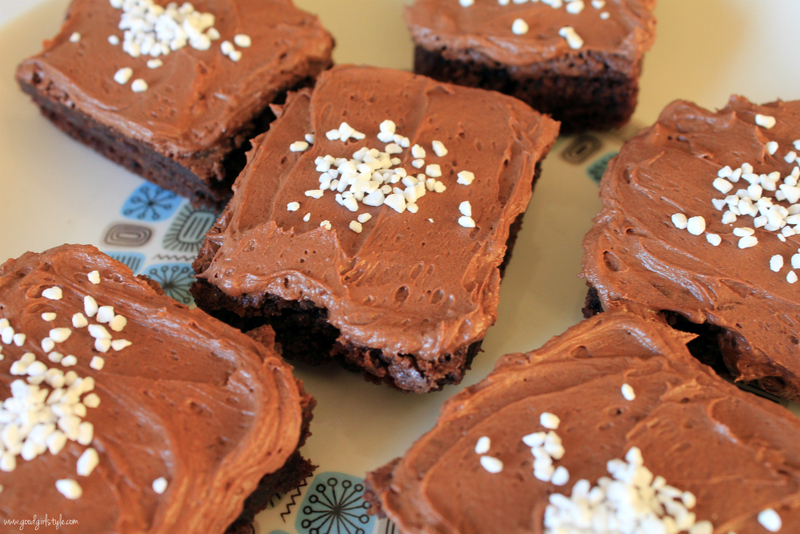 The fudgy brownies, the whipped frosting, and the crunchy sugar. Orange, chocolate, ginger, and pearl sugar? A match made in New Nordic heaven. Note: This is a unique technique, but don't let it scare you off! It works, I promise! Preheat oven to 350 degrees F. Lightly grease or line with parchment paper a 9"x13" pan. Beat the 4 eggs with the cocoa powder, salt, baking powder, and ground ginger. This will be a very thick concoction. Now, in a small saucepan, melt the butter and add the sugar. Heat until thoroughly hot but not simmering, being careful not to scorch the mixture. Combine the two mixtures, adding only a little of the hot butter to the egg mixture at first to temper the eggs. Then stir in the rest of the mixture. Stir in the flour and fresh ginger until just combined. Pour into prepared pan. Bake for approximately 30 minutes or until a cake tester comes out clean. Beat the butter. Then sift in the powdered sugar and cocoa powder, and mix, scraping down sides frequently. Add the orange oil and the milk and beat until whipped. 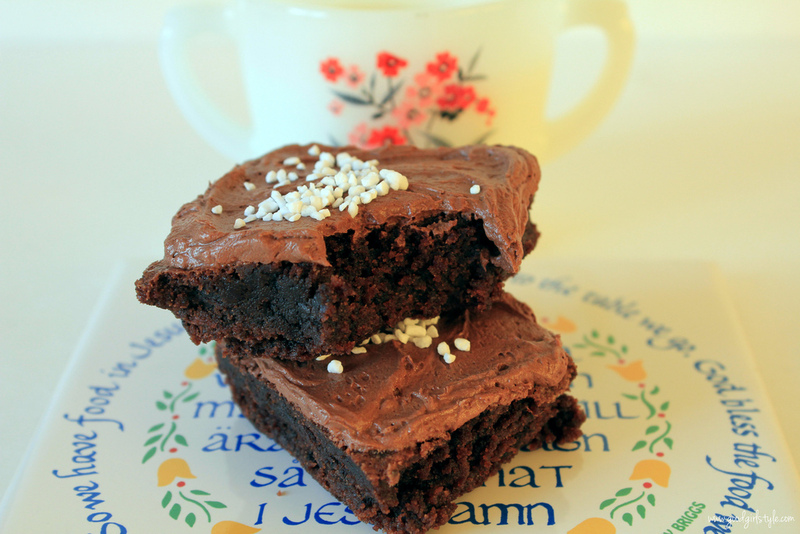 Cut and frost brownies when cool, and sprinkle with Swedish Pearl Sugar. *Ingredients provided by King Arthur Flour. Thank you, KAF! 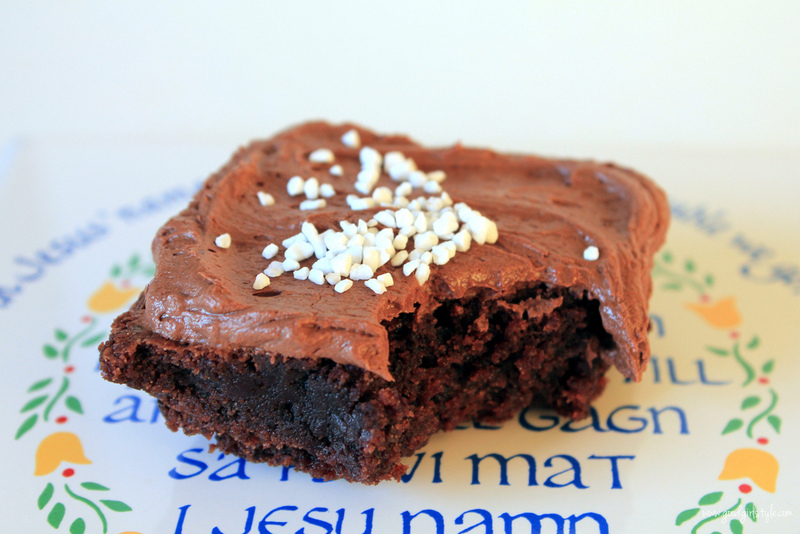 Brownies may be all-American, but if you call it kladdkaka, then you've got yourself a delicious Swedish dessert! I love the idea of adding ginger and orange to brownies...and that frosting looks divine! These look AMAZING! I'm definitely going to try them! YES!!! I updated to add that :-) Thank you! :-) If only that were possible! I tried it! And it is to DIE FOR. Oh my gosh this frosting is amazing. 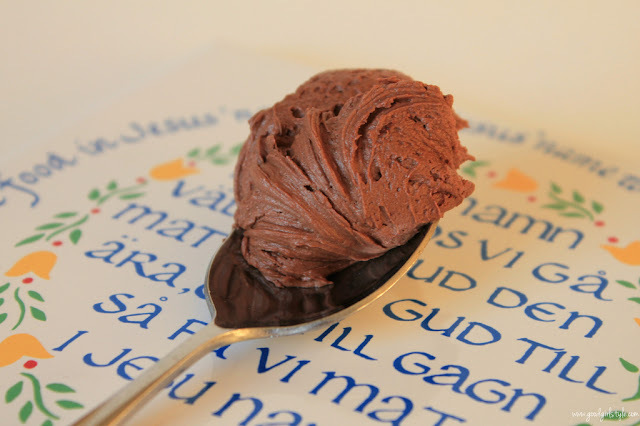 It is seriously the best chocolate frosting I have EVER made, and I have been searching for YEARS. Awesome work girl! This makes me so happy. So, so happy. Here from the incourage writer's group. I'm lovin' your blog and died laughing when I read this line "I think it's the next "Nutella." As if Nutella would ever be "over." But seriously." Also loved hearing "uffda." My parents were ministers at a Scandinavian church when I was a teen and I loved all those wonderful people and the delightful treats they would bring us (like pepparkakkar - yum).